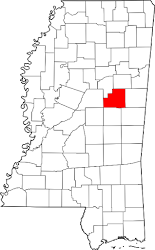 Winston County's Solid Waste Department was set up in 1993 by the Board of Supervisors. Contact Kathy in the Courthouse Annex at 662-773-8634 for all information. Payments may be made by mail to P.O. Box 884 (see mailed statement) or to pay your bill in person, go to the Winston County Tax Assessor's Office. If you purchase a home or mobile home in the county, contact this office to set up an account. If you rent and the landowner does not pay the solid waste fee, you will need to contact this office to set up an account. When you move, contact this office so that your account will not continue to be charged. Any changes to your account needs to be reported so that the account can be kept accurate and non-delinquent. Solid waste pick up is once a week on the appointed day dependent on location. Contact this office to verify your day of service. Only household garbage is allowed and it must be bagged. If an account balance exceeds $96 (one year) a lien is filed against the property. Car tags associated with that property will be held until the bill is paid in full. No partial payment is accepted. Liens remain with the property and unpaid amounts can complicate the sale or transfer of property.